The long-term study, published in the BMC Medicine journal, looked at the link between the traditional Scandinavian pastime and CVD, the term given to conditions affecting the heart or blood vessels. Researchers found that the amount of time spent bathing as well as frequency of use meant lower risks for males and females and could be because saunas mimic the effects of mild physical exercise. CVD is one of the main causes of death and disability in the UK, although it can often be prevented through healthy lifestyle choices. Researchers studied the bathing habits of 1,688 over-50s in Finland, approximately half of which were women, and followed up on their health after roughly 15 years. Those who bathed four to seven times a week accounted for fewer than three of the deaths per 1,000 person years, the collective total amount of years people remained in the study. This was compared to a little over 10 for those who used a sauna just once a week. 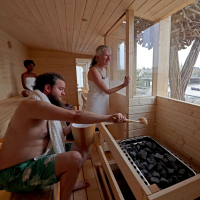 Professor Jari Laukkanen, a researcher at the University of Eastern Finland, said: "An important finding of this research is that more regular sauna use is associated with a lower risk of death from CVD in middle-aged to elderly women as well as in men. "There are several possible reasons why sauna use may decrease the risk of death due to CVD. Our research team has shown in previous studies that high sauna use is associated with lower blood pressure. "Additionally, sauna use is known to trigger an increase in heart rate equal to that seen in low to moderate intensity physical exercise." Deaths from CVD were also found to decrease with time spent in the sauna, with those who spent more than 45 minutes-a-week bathing accounting for 5.1 deaths per 1,000 person years. This was compared to 9.6 for those who spent less than 15 minutes in the sauna weekly. However, the study has its limitations and the researchers stressed their findings were from one region and further study would be needed to generalise across all populations. If you're living with CVD conditions and are looking for travel insurance that meets your medical needs, then check out our dedicated heart conditions medical travel insurance today.